I love this bread, so easy to make & no messing around. 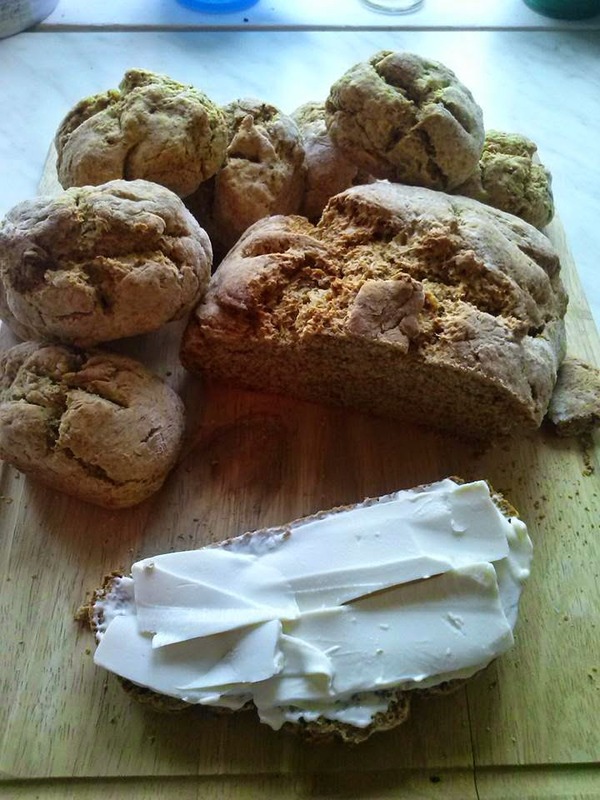 I have been told by three different people that is exactly as they remember from their childhood in Ireland or how their Irish grandmother made it so I am well chuffed with this recipe. It is easy & quick. Apparently it was specifically for fresh bread at breakfast time. Tip if you want softer outside (recommended by me) wrap the loaf or rolls in a clean tea towel as soon as you take it out of the oven. If you want it crusty cool on a wire rack. Sift together flours, salt, sugar & soda rub in butter. Make a well & add enough milk to make a soft dough don't add it all at once as it may need less ( I have learn't the hard way) I usually add 250ml then a little more up to 350ml but 250 - 300 ml. Knead just a little, make into a round on a baking sheet with a little flour on it cut a + into the top. Keep a check on timings for the first one as oven vary you may need to adjust time or temp.